Bodhgaya, Bihar, India – Bodhgaya’s usually teeming streets were almost empty and the teaching ground was only beginning to fill when His Holiness the Dalai Lama reached there just before 7am this morning. He greeted the early arrivals and sat down in front of the mandala pavilion to begin preparations for the Thirteen Deity Vajrabhairava Empowerment. Two monks from Namgyal Monastery sat with him to accompany his recitation of the rite. An hour and a half later he told the congregation that he had developed a bit of a cold. “It’s been a month and a half since I left Dharamsala. I’ve been in Mumbai and at Drepung, Ganden and Sera giving public talks and teaching, which have made a little tired. Tomorrow I’m going to take a break and the day after that, because it’s short, I’ll give the Solitary Hero Vajrabhairava Empowerment, but I’m going to postpone the Chakrasamvara Empowerment to another time. 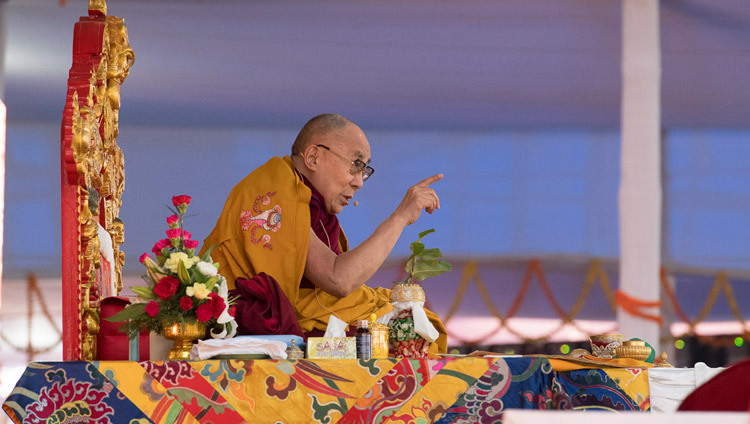 His Holiness remarked that the Buddha’s general teachings were given in public, but tantra was given in secret. This was not because the Buddha did not want to share these specialized instructions, but because they deal with channels, energies and drops and it can be dangerous to engage with them without training and guidance. Many years ago the learned Indian Professor, LM Joshi told His Holiness that one of the reasons Buddhism declined in India was that monks became wealthy and the public disapproved and lost their faith. A second reason was the abuse of tantra—taking a consort is incompatible with observing pure Vinaya. Finally, kings and other local rulers gradually transferred their support to non-Buddhist traditions. 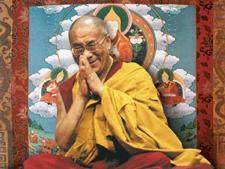 His Holiness suggested that practising tantra in secret is therefore also a matter of discretion. He then began to bestow the empowerment, which he accomplished with unflinching energy.